The standard for a medium natsume: 6.6 cm Students of tea ceremony school basically use this size natsume when learn “Fukusa-sabaki” in first practice session. 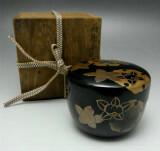 The standard for a small natsume: 5.0 cm Also, though small natsume are also used for koicha, they must have no design. 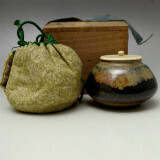 Flat shape usucha tea caddy, size ratio is approx. 3:2 in many hira natsume. Angled as if to appear like shrugging shoulders, it expands out ever so slightly from torso to waist, finishing with a taper at the base. Just like it appears, it is called katatsuki due to its raised shoulders. 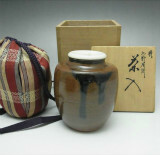 It is said that nasu (aubergine) tea containers are the masses, whereas katatsuki are the great generals, having been especially loved by samurai. They reportedly favoured them due to their resemblance to a warrior's posture while sitting in seiza. 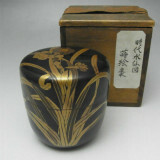 The name Nasu dervies from the shape of the container resembling the fruit of the aubergine plant. Generally round with a bit of plumpness at the bottom, it has a narrow aperture. 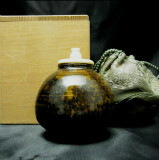 It is thought that they were used in China as oil pots, although when they reached Japan they were used for tea, formerly considered the highest grade Chinese tea container. 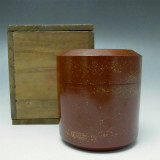 There is a famous example known as the tsukumo Nasu tea container. The name Bunrin originally comes from the shape resembling that of an apple, Bunrin being an elegant synonym for apple; during the reign of Emperor Gaozong of the Tang Dynasty in China, when a man named Li Jin offered a beautiful apple to the emperor, the overjoyed emperor made Li Jin a government official with the name Bunjinro - or so the story goes. 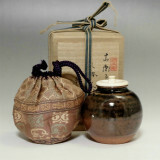 Bunrin is the exemplary tea container style of Chinese origin, a small pot with a beautiful shape from shoulders to torso and a low base that since time immortal has been considered the finest of Chinese tea containers along side Nasu; there are specialty versions as well, some of the more famous being Jukou, Honnoji, Hamuro, and Chikushi.